There are lots of ways to deal with missing or damaged teeth. You’ve probably heard one of us at Discovery Dental talking about implants, dentures, bridges, and crowns, but have you ever wondered what they are and how they work? Dr. Marissa Miller knows that folks in Shelby like to be informed, so think of this as your personal guide to things that might end up in your mouth. As always, if you have any questions, feel free to give us a call! 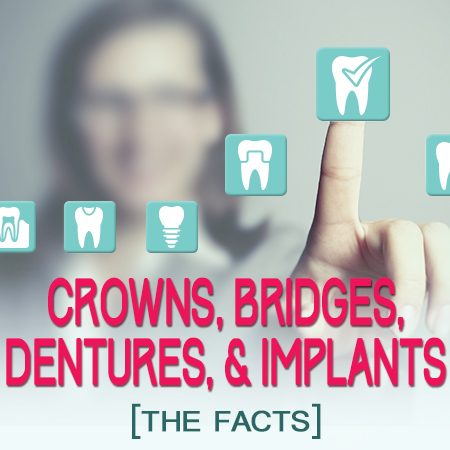 Crowns themselves do not replace entire teeth, but they play an important role in the process of stabilizing teeth and supporting other devices that restore harmony to your bite. Sometimes, Dr. Marissa Miller will place a crown on a Shelby patient’s tooth to improve its appearance or strengthen it after a cavity has left the tooth unable to support a filling. Placed directly over the surface of the tooth (like a king’s crown), crowns can also be used to protect weak teeth, repair broken teeth, attach and anchor a bridge, and/or cover an implant. They come in a variety of materials and colors to suit a number of different needs. If you have lost most or all of your teeth, dentures may be the way to go. Dentures are natural-looking, removable appliances that allow you to eat and speak normally, despite a lack of teeth. They also help prevent sagging of the facial muscles, which can occur if there are little or no teeth to support the structure of your face. There are three types of dentures: conventional, immediate, and overdentures. Conventional dentures require the removal of any remaining teeth and a healing period (sometimes several months or longer) before they can be fitted. Immediate dentures also require the rest of your teeth to be removed, but are inserted the same day as the removal. Overdentures are a great option if you have a few healthy teeth left. They are called overdentures because Dr. Marissa Miller fits them over your remaining teeth, which provide support and help keep your jawbone healthy. Although the process of adapting to your dentures may be uncomfortable at first, having functional teeth is much better for your health in the long run! In terms of preserving the integrity of the jawbone and providing support and strength to nearby crowns, bridges, and/or dentures, implants are the best option for missing teeth. Implants are small, titanium posts that Dr. Marissa Miller inserts directly into your jawbone. The bone grows around them, much like a natural root, and fixes them in place. Once the bone around the implant is fully healed, a replacement tooth is placed over the implant. This is the closest you can come to a natural tooth. Stimulation from chewing with dental implants helps to preserve the jawbone and encourage circulation in the surrounding area. Implants are a permanent solution for a healthier smile. Even if missing teeth aren’t visible and don’t seem to affect your bite, it is still important to do something about them. Dr. Marissa Miller wants every Shelby resident to know that the reasons for using crowns, bridges, dentures, and implants go beyond cosmetics and comfort. Your adult teeth are designed to work as a team, and any missing player can compromise the function of your bite, ease of speech, susceptibility to dental disease, and the health of your jawbone. Call Discovery Dental today to make an appointment and we’ll help you get the beautiful, healthy smile you deserve!